Evan here is in Hawaii and he’s planting the sunflower seeds you sent me. He told his mom that he needs to talk to the seeds to give them extra CO2. 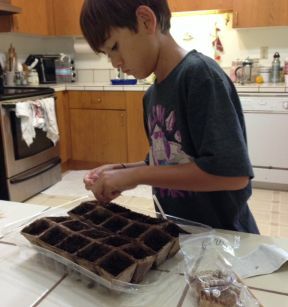 A few days later he asked his mom to yell at the seeds to help them grow. He doesn’t like to yell at people and things so would she do that for him? A few days later, the seeds all popped. He is so excited. My friend Red told him, sunflower seeds are not deaf and they can hear whispers. My sunflowers are over 5 feet high in Sacramento, Tyler. I wrote this poem and it’s not about you or Evan. It’s about all those children who never planted a sunflower seed. You both hold a very special place in my heart.